At the weekend, I look forward to two things - booze and bacon, usually in that order; Saturday nights for booze and Sunday mornings for bacon. The fact that I can combine these two things, with the energy boosting powers of coffee and the sweet hit of maple syrup in a mind boggling savoury/sweet/boozy jam, is almost just too much excitement. Bourbon. Bacon. Jam. Is it a breakfast jam? Well, yes, it has bacon and coffee and you can spread it on toast. Or is it a savoury accompaniment? Well, also yes, its umami (for lack of a non-foodie word) character is divine with slow roasted meats like pulled pork, or simply slathered on a slice of crusty white bread with a slither of avocado. That said, dare I bare my true self and say it's probably best eaten with a spoon straight from the jar in the fridge because after I've taken a pic for the blog I'm too lazy to do any of the above? Yes, I surrender. There was a bit of craze a few years ago for bacon jam and the foodie world went mad for it but I never got round to making it...until now. Perhaps the prospect of turning thirty has me tying up my pinny a la Barbara from The Good Life, proclaiming self-sufficiency and being all 'look-at-me-I'm-an-adult-and-I-make-jam'! Luckily the addition of bourbon cements my place as a twenty-something with an 'alcohol-makes-everything-better' attitude. 1. To a large pan/pot over a low-medium heat, add the bacon strips and let the fat render out. Once cooked, drain the fat and set aside. 2. To the pan add the butter and when melted, add the onion and garlic. Allow to cook slowly until transparent. 3. Add the cider vinegar, brown sugar and maple syrup and stir to combine. 4. 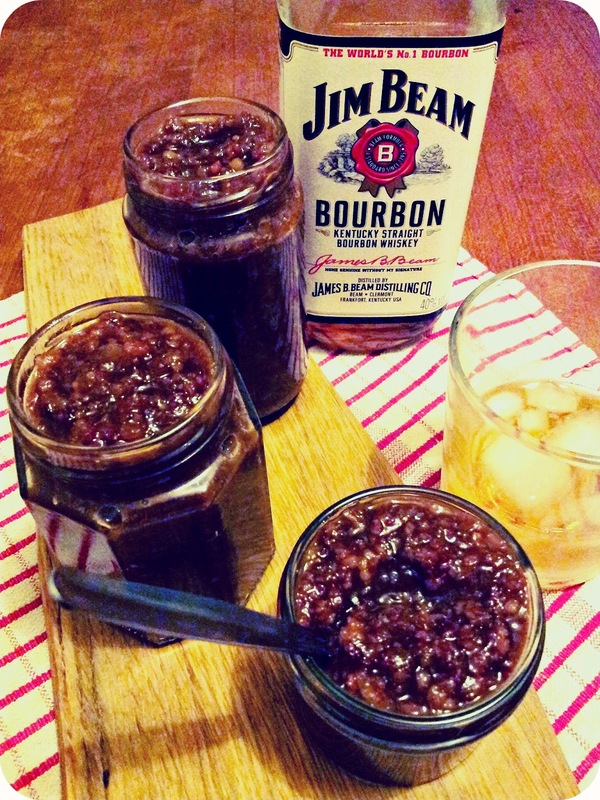 When the mixture starts to thicken slightly, add the bourbon and coffee. 5. With all liquids in the pan, add the remaining ingredients; paprika, mustard, ground ginger, grated nutmeg and the chipotle chillies. 6. Simmer over a low-medium heat for approximately an hour until mixture has reduced and thickened. 7. Transfer to a blender and blitz until desired consistency is reached (I left mine so it still had recognisable bits of bacon). 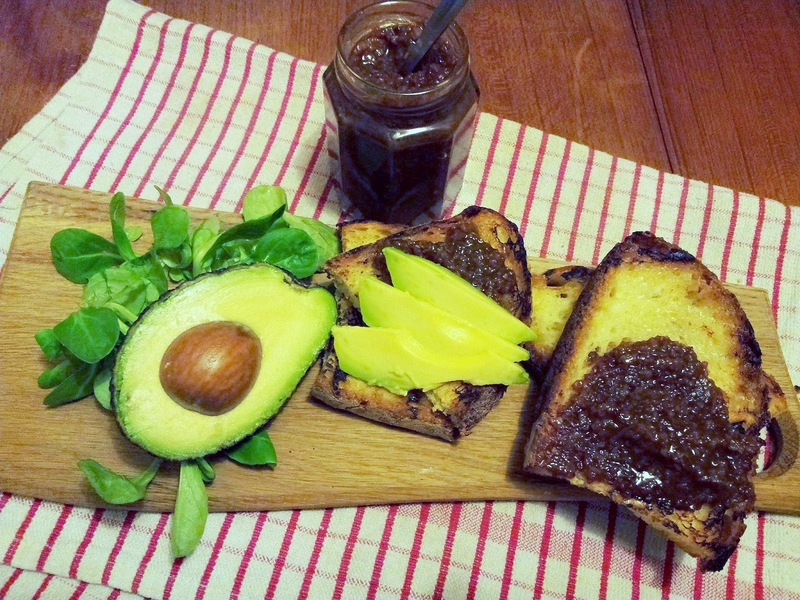 Serve warm with toast and fresh avocado....drool! Pour into sterilised jars, and allow to cool. Once cool, add a wax disc an screw on the lid. Or, like I did immediately, toast some bread and slather on the jam while it's still warm - guaranteed it'll be a while until the lid goes on! 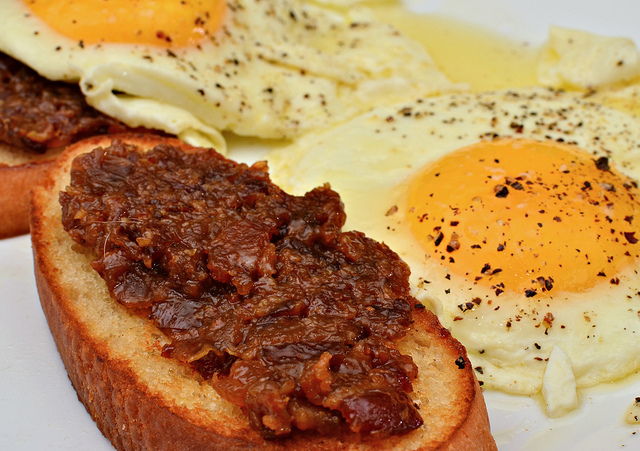 Thanks to Spoon Fork Bacon and Eat Like a Girl (two foodie blogs I love following), whose bacon jam recipes have inspired me to make my own.